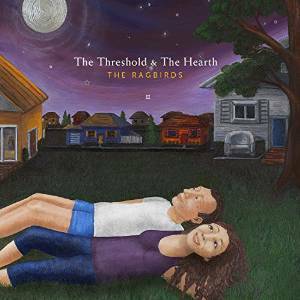 Hailing from Ann Arbor, MI, The Ragbirds are a band that have transcended the typical avenues of traditional roots music to develop something totally new from the ground up. The most exciting part of their music as a whole might just be their acknowledgment of the folk traditions upon which their tunes have settled upon as a foundation, no matter how far their individual branches may grow in any which way. Foremost, this is seen in the wholesome storytelling of their overall catalog, and pervades the whole of their latest album, The Threshold & the Hearth. These communal ties to the folk scene, as vibrant and varied as it may have since become, might even best be seen here, in this particular record, as it deals with such themes as family, friendships, romance, and birth. The deal is sealed with the continued worldliness of their sound, blending an eclectic, multi-cultural mix of roots music from across the planet, from Africana to Americana and well beyond either. The aforementioned themes are sealed and delivered with a sincerity which makes the album feel like just that much more of a complete, concerted effort. The “why” behind that comes with a bit of digging into Ragbirds history, where one would uncover that frontwoman Erin Zindle and percussionist Randall Moore are not only a couple, but one that recently celebrated the birth of their baby daughter. The birth introduced the inspiration for The Threshold & the Hearth, and the album feels a lot like the band’s current magnum opus as a result. Not only has this created a lyrically evocative work, however, but also an incredibly musically diverse blend of sounds that come across as that much more of a masterclass work with a slightly larger dosage of passion tossed behind each bang of a drum, every strum of the guitar, and so on and so forth. Erin’s brother T.J. plays amicably on his retro-tinged guitar licks while Moore, bassist Dan Jones, and drummer Jon Brown hold down the fort with a series of layered rhythms. Wrapping it all together is the aforementioned Erin, whose sweet vocals envelope each song with an intensely comforting wisdom and ease. Together, they make The Threshold & the Hearth one of the best independent releases in music this year, if not across the decade thus far. The Ragbirds are an absolute gem worthy of an ear, and you can find out more about them (including where they’ll play next) on their official Facebook page.